The past never truly leaves us. It deposits itself, once used up, in layers underneath us, forming the foundations that we walk on in the present and the future, for better or for worse. The modern Clark Fork Basin, the largest complex of Superfund environmental cleanup sites in the U.S., is the result of a past shaped by a confluence of forces, both natural and human-created. 100 years of mining and smelting at the headwaters in Butte and Anaconda significantly impacted the area, and some of those impacts were channeled down the creeks of the basin, ultimately impairing the ecological health of the Clark Fork River. In 1908, mining in Butte had been booming for several decades, while down the road in Anaconda ore processing operations spread air and water pollution throughout the Deer Lodge valley. Further downstream near Missoula, construction had just been completed on Copper King William Clark’s Milltown Dam. The dam was built to power Clark’s nearby lumber mill, which supplied timbers for the mines back upstream, as well as modern trolley cars, streetlights and electricity in Missoula. 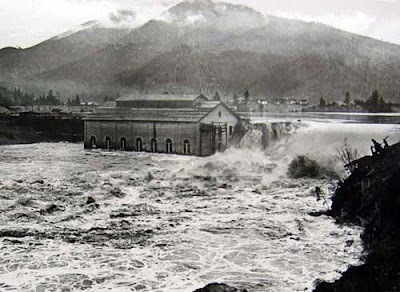 In June of 1908, a massive flood event, the largest of historic record, exacerbated the environmental impacts already occurring at the upper end of the basin. In Butte and Anaconda, mine tailings that had been disposed of in and along local creeks were picked up by the momentum of the rising waters and washed downstream. Some tailings were deposited in floodplains. In the Clark Fork floodplain in the Deer Lodge valley, patches of such tailings, often called “slickens”, are still clearly visible as bare patches of dirt with little or no vegetation. The force of the flood carried a large volume of tailings past the town of Deer Lodge, and, as the Clark Fork’s channel narrowed and, with water added from the Little Blackfoot River, Flint Creek, Rock Creek, and other tributaries, fewer tailings sediments settled out of the water as it made its way down toward Missoula. Finally, the flood pushed this large volume of tailings into the Milltown Dam. The contaminated sediments settled out in the reservoir, where they remained until the recent dam removal and restoration project. The effects of the 1908 flood have flowed into modern times. Looking across the basin today, we can see these effects in the ongoing restoration of Silver Bow Creek as streamside tailings deposited by a century of mining are removed. We can see these effects in the slickens dotting the landscape of Deer Lodge Valley; restoration of this section of the river should begin in the next few years. We can even see these effects in the waters themselves, where, if there is heavy runoff or rain, metals and other contaminants wash in, threatening fish and aquatic life. We can see these effects 120 miles downstream at the Milltown Dam, where tailings deposits contaminated the local aquifer with arsenic and ultimately played a key role in the decision to remove the dam. And we can see these effects at the BP/Arco Waste Repository near the town of Opportunity, where tailings from Silver Bow Creek and Milltown are shipped and spread out atop the six square miles of tailings already present at the site from the old operations of the Anaconda Smelter and Reduction Works. And so in 2008 the tailings that washed downstream to Milltown a hundred years ago are making the trip home, back upstream to Opportunity, not quite reaching their ultimate point of origin on the Butte Hill. As we go forward in restoring the Clark Fork River, it is essential to remember the past and its consequences. Our actions also have consequences, some immediate, some very long term, and many we do not have the ability to see or predict. As we proceed with restoration, and as the natural resource economy continues to be a part of Montana culture, we must be mindful that our actions today will carry over into tomorrow. Restoration is no easy task, neither is limiting the impacts of civilization, growth and development on the natural world. But if we don’t wish to lose the rivers, landscapes and wildlife we profess to love and treasure here in the Treasure State, then we must continually work to understand the consequences of our actions and to do our best to maintain the health of our last best environment. It would be a mistake to think that the cleanup of the Clark Fork will some day be “finished” or “complete.” The cleanup of the Clark Fork and similarly impacted rivers is not so much about a linear series of tasks to be completed as it is about our long-term relationship with the river. A culture of environmental stewardship is blooming in Montana, motivated by past impacts, but once the visible remnants of those impacts have been restored and removed from our field of vision, we must keep our eyes locked firmly on that slippery concept of stewardship in the hope that, in another 100 years, we can celebrate the centennial of a healthy Clark Fork River.